There is a saying in Tainan, if you come here for a visit without eating a bowl of beef noodle soup, it is as if you have not visited Tainan at all. Besides the famous beef noodle soup, Tainan is also known for a variety of delicacies. 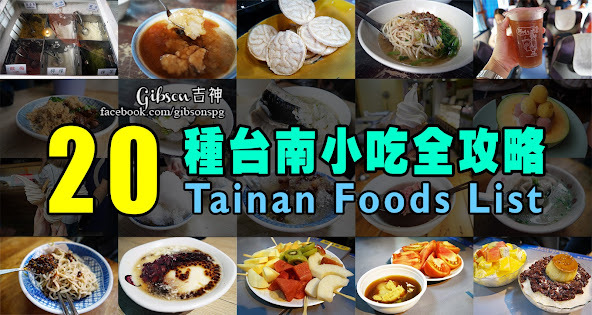 Gibson was invited by the Taiwan Tourism Bureau Malaysia Office and China Airline Penang Branch to explore their food haven in the south, and here is the list of his recommendation. Before starting the food hunt, Gibson needed to verify that the food list is locally original to ensure an authentic food trail. Our first stop is to hunt for traditional dessert, and Bored wolf is the shop that we are looking for. Many come here for their cute Macaron Ice Cream, but we want something more nostalgic, where the owner produced their Ice Cream with an old ammonia ice machine from the 30’s, in order to get the 50’s flavour and texture of the Ice Cream. Besides tasting the nostalgic flavour, you also get to see the machine in the shop too. If to hunt for traditional local dishes in Tainan, Sen Maw Rice Food Restaurant (森茂碗粿) is the best place to start. There are 2 Sen Maw outlets in Tainan and we went to the one at Kaishan Road, which we tried their 3 most popular dishes. Wha Gwei is a kind of rice cake that contains minced pork, which explains the brownish colour, and if you were to add minced garlic to it, you will get the spicy kick at the end. The texture feels like jelly-like yam cake. The fish ball soup is actually a bowl of sweeten broth. The sweetness was a bit awkward, however the springy fish ball was enjoyable. The origin of“Dan Zai” noodles began with a particular fisherman in ancient Taiwan, who unable to go fishing due to the rough sea season had to peddle noodles in the streets. This is how the noodles got its name. It is just a common clear soup noodles, but the water spinach is crunchy and tasty. Came across this particular shop in our food hunt, and later we googled and discovered that this shop is the first in Taiwan to produce non-oil-fried crackers. They actually demonstrate the process in front of their shop, and sample tasting is provided. In Tainan, if you see these characters “石精臼” displayed on any shop, you can expect it to be an old and famous outlet with at least 50 years of history. We came to 「石精臼點心城」in order to look for a particular stall that has nearly 80 years of history, the “Chuah Family Glutinous Rice”, which is also one of the dishes that was showcased at 2010 ShangHai Expo. The Rice Cake in Tainan tastes like braised pork over rice. Although it is made of glutinous rice, but only has the “stickiness” of Japanese rice. While it is served with braised pork and fish floss, every bite is full of flavour, it’s a must eat food in Tainan. A big piece of fish belly in porridge with a touch of ginger, this is the real taste of the sea. There is a Sacrificial Rites Martial Temple in Yongfu Road, where you will find a food cart in front of the temple that sells Peanut Brittle. It is freshly made, which attracts numerous curious tourists to witness the making process. The Peanut Brittle roasted over fire then crushed and flattened, then rolled up with fresh coriander before serving. It has a tough texture, but the coriander adds a fresh flavour to the peanut brittle. Not too far from the Peanut Brittle Cart, there is a shop that sells winter melon tea. It was learnt that the first generation owner setup the shop to produce sweetened winter melon, but later the youngest son of the fourth generation expanded the business by selling winter melon tea with his own secret recipe. If you see a long queue in front of a shop not far from the Peanut Brittle Cart, then that’s the place you need to queue up to buy the famous winter melon tea. The tea is not too sweet and very refreshing. When leaving the old town, we came across the famous dessert chain- Baelle, where their Hokkaido Fresh Milk Soft Serve was selling for only NT$35. If you like the Sundae ice cream of McDonald, you will love this even more with the right dairy flavour, that give a refreshing feel with every bite. Although Zheng Xing Street is just a corner of a street, but the owners of the shop are working hard to create a happening in the area. By now they are one of the famous spot in Tainan that is flooded with tourists, especially the young. Upon arriving at Zheng Xing Street, you will find 2 shops with a long queue, even when it is a hot day. They are the famous Tai-Cheng Fruit Shop and NINAO Gelato. Many come here for this Hami melon Ice Ball, and they are served with half of a melon with fruit smoothie and Gelato of your choice. Before queuing, please remember to take your number and the numbering machine is on the left side of the shop. If you are lucky, you get to taste your soft serve within half an hour, but it normally takes an hour. They serve 2 flavours in a day. On our visit, we got the Chestnut and Tieguanyin Tea. Gibson preferred the Tieguanyin Tea that tasted like Matcha, but with better tea aromatics. However, The Chestnut was just too normal. As Gibson mentioned above, there is a saying in Tainan, if you come here for a visit without eating a bowl of beef noodle soup, it is as if you have not visited Tainan at all. All this is due to Tainan having numerous cow farms and also slaughter houses, that ensures fresh meat will be delivered to the restaurants within an hour for immediate preparation and cooking. This particular food stall was not within our plan, but just a randomly pick spot. It turns out that the beef was tender and juicy as expected, while the soup was clear and not oily at all, but wonderfully delicious. Business Hours: 8am - 8pm，Closed on Tuesday. There is a hidden gem in the Ximen market （commonly known as Tua Market） at Guohua Street that sells Pineapple Ice dessert. However, when we found this Jiang Shui Hao Shave Ice Shop, the Pineapple Ice dessert was sold out, so we had no other choice but to try some other desserts. If you happen to visit the shop, please try the famous Pineapple Ice dessert and let Gibson know whether it lives up to its name. The yam from Taiwan is well-known for it good quality, and this Yam Ice lives up to it name and is worth trying. 8 “Chinese treasures” that consist mostly of nuts that is served with shaved ice. The aroma from the almond can be overwhelming. The sweetness from the green bean add a new dimension. Next to Jiang Shui Hao Shave Ice Shop is the Fu-Rong Repasts which is famous for their egg noodles. Their egg noodles is one of the most famous dishes of Tainan, and we ordered a bowl of noodles and wonton, it was love at first bite. The minced meat has a good flavour and texture. It is a recommended dish to try. The Egg Noodles was served with minced pork and specially made Chili. Gibson like the aromatic spiciness of the noodles, and the pork on top was actually Char Siew, but it doesn’t look like with our red and black version back home. In Tainan, there is a famous dessert shop named Tongji Anping Bean Jelly. We couldn't make it to their main store, but fortunately we found out there was a stall at the basement of Shin Kong Mitsukoshi mall.Our common Soya Bean Curd added with red beans and small tapioca pearls, great flavour with the small sweetness. Found this Guava with Licoricey Root Powder stall at Shin Kong Mitsukoshi basement with a long queue, then you know this is something you should try. Apparently, you have 2 types of Guava to choose, the crunchy “white meat” or the soft “red meat” that is served with the Licoricey Root Powder. Yet they will only cut and serve once you have placed your ordered to ensure freshness. Tainan is a land of fruits, therefore there are many fruit stores in town, and there is one particular fruit store that is very happening at night. Even after midnight many will come here and queue, just to enjoy a fruit platter. Yu Cheng Fruit Store is the place that Gibson was truly excited. The price list presented here is as on 28th October 2016, the day when I visited the places.